Lean proteins are good for muscle growth and development. Try chicken pasta salads, turkey, or healthy chicken nuggets (see Chicken Nuggets: Are They Really That Bad). Remember beans and lentils are packed with protein and have compounds that protect against cancer, heart disease, diabetes and obesity. So you don’t have to include meat in a growing child’s diet every day. Try a pasta bean salad with a healthy salad dressing. It’s a good alternative to peanut butter in nut free school zones. Our favorite is quinoa pasta –don’t overcook it. For carbohydrates –think if it’s white it isn’t right! Choose 100% whole grains for your child’s growing brain and body. White grains are stripped of all the disease fighting nutrients like B Vitamins, minerals and fiber. These are just what your child needs to help him or her grow healthy and strong. Research shows, food effects how your child’s genes act now and later. Choose the right fats. Olive oil, reduced fat cheese, skim or 1% milk, avocado contain heart healthy fats to keep that little ticker ticking best. Nuts are good too, for kids over 3 when allergies aren’t a concern at your school. Think color! Red, yellow, green, orange, purple, green, brown, black, white. How many colors can your child enjoy from foods likes, fruits, veggies, whole grains and beans? Whatever colors are missed at breakfast and lunch try including at dinner. For example, the lunch above is missing purple, white and greens –so we’ll likely have an afterschool smoothie with blueberries and include sugar snap peas and cauliflower at dinner. Always include a fruit and vegetable. Read more about color power with plant power! Variety is the spice of life. Pick out some lunch recipes with your child and check back again here for more preschool lunch ideas. 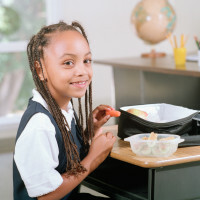 Share a comment on your super kid’s favorite lunch. Get more school lunch ideas now with lunch leftovers. Great ideas and tips for packing lunches for our precious children. It is time to change the colors our kids get in their lunch box from colorful wrappers of candies and bars to colorful fruits and vegetables. Great tip! Thank you!